Omega-3 fatty acids have anti-inflammatory properties and heart-healthful benefits. You can get fatty acids either from food or fish oil supplements. Fish such as mackerel, salmon, tuna, sardines and halibut are rich in omega-3 fatty acids, as are plant oils such as flaxseed and canola oil. Fish oil capsules are another way to get your omega-3 fatty acids. Fatty acids in fish oil are docosahexaenoic and eicosapentaenoic acid. Fish oil should not be taken without medical supervision because it is not suitable for some people. Fish oil capsules usually contain 120 milligrams of DHA and 180 milligrams of EPA per capsule. No more than 3,000 milligrams, or 3 grams, of omega-3 fatty acids from capsules should be taken without medical supervision, reports the University of Maryland Medical Center. Ensure that you get your fish oil capsules from a reputable company whose products don't contain any pesticides, mercury, cadmium or lead. Taken in high doses, fish oil can increase the risk of bleeding, according to the National Center for Complementary and Alternative Medicine. Persons who have bleeding disorders, bruise easily or take blood thinners such as aspirin, warafin or clopidogrel should seek medical advice before taking fish oil capsules. 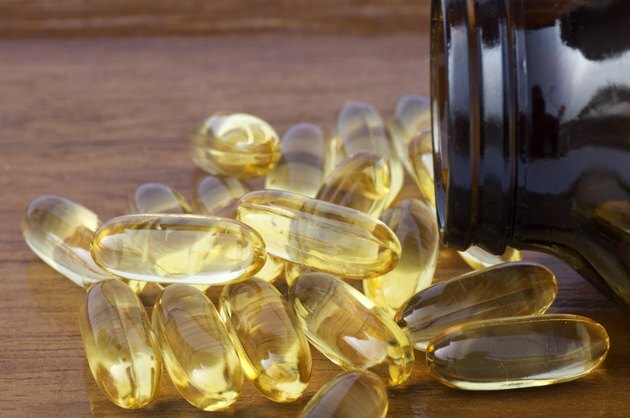 Pregnant or lactating women should not take fish oil capsules without consulting their doctor. However, the likelihood of ingesting mercury is much lower with fish oil capsules than with fish. According to the Food and Drug Administration, mercury can harm the developing baby's nervous system. Also, fish oil might contain polychlorinated biphenyls -- PCBs -- and dioxins, which are harmful to human health. Fish oil can raise fasting blood sugar level in some Type 2 diabetics, so it should not be taken without medical supervision, according to the University of Maryland Medical Center. This is especially crucial if you are taking blood sugar medications such as insulin, glipizide, gluchophage or glyburide. Your doctor might increase your medication if you wish to take fish oil capsules. Don't take fish oil capsules if you are allergic to fish or nuts. Rare incidences of skin rashes have been reported among persons taking supplements that had other food allergies. People 18 years of age and younger should not be given fish oil capsules unless under the supervision of a doctor, according to the University of Maryland Medical Center. Children also should not eat fish with a possibly high mercury content, such as swordfish, shark or tilefish. How Much Fish Oil Can My 5 Year Old Take?